Why you should never celebrate too early. Playing the Fewl: The Rat Race for a New Game Machine. 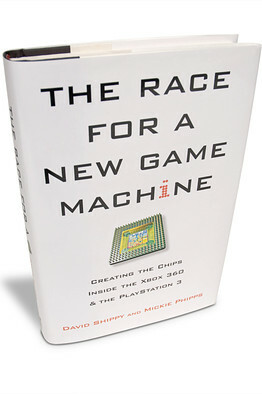 A new book titled The Race for a New Game Machine: Creating the Chips Inside the XBox 360 and the Playstation 3 was released on the 1st of Jannuary this year that looks into the development of the Microsoft Xbox 360 and the Sony Playstation 3 which, as it turned out in the end, were both developed by the IBM Corporation. When the companies entered into their partnership in 2001, Sony, Toshiba and IBM committed themselves to spending $400 million over five years to design the Cell, not counting the millions of dollars it would take to build two production facilities for making the chip itself. IBM provided the bulk of the manpower, with the design team headquartered at its Austin, Texas, offices. Sony and Toshiba sent teams of engineers to Austin to live and work with their partners in an effort to have the Cell ready for the Playstation 3’s target launch, Christmas 2005. But a funny thing happened along the way: A new “partner” entered the picture. In late 2002, Microsoft approached IBM about making the chip for Microsoft’s rival game console, the (as yet unnamed) Xbox 360. In 2003, IBM’s Adam Bennett showed Microsoft specs for the still-in-development Cell core. Microsoft was interested and contracted with IBM for their own chip, to be built around the core that IBM was still building with Sony. All three of the original partners had agreed that IBM would eventually sell the Cell to other clients. But it does not seem to have occurred to Sony that IBM would sell key parts of the Cell before it was complete and to Sony’s primary videogame-console competitor. The result was that Sony’s R&D money was spent creating a component for Microsoft to use against it. Mr. Shippy and Ms. Phipps detail the resulting absurdity: IBM employees hiding their work from Sony and Toshiba engineers in the cubicles next to them; the Xbox chip being tested a few floors above the Cell design teams. Mr. Shippy says that he felt “contaminated” as he sat down with the Microsoft engineers, helping them to sketch out their architectural requirements with lessons learned from his earlier work on Playstation. The deal only got worse for Sony. Both designs were delivered on time to IBM’s manufacturing division, but there was a problem with the first chip run. Microsoft had had the foresight to order backup manufacturing capacity from a third party. Sony did not and had to wait another six weeks to get their first chips. So Microsoft actually got the chip that Sony helped design before Sony did. In the end, Microsoft’s Xbox 360 hit its target launch in November 2005, becoming its own success. Because of various delays, the Playstation 3 was pushed back a full year. The book (which arrived on Friday!) goes into all the juicy bits that lead up to the delivery of both processors, well worth the $14USD its listed for on Amazon. Whilst I havent finished the entire book yet, thus far its full of twists and corporate musings and tricks with an interesting look at the teams and people that made these two products possible in the end. You’ll be hooked from the first page – I guarantee it. BD+ is a component of the Blu-ray Disc Digital Rights Management system. It was developed by Cryptography Research Inc. and is based on their Self-Protecting Digital Content concept. BD+ played an important role in the past format war of Blu-ray Disc and HD DVD. Several studios have cited Blu-ray Disc’s adoption of the BD+ anti-copying system as the reason they supported Blu-ray Disc over HD DVD. One of the more humorous observations was that unlike DVD (which used DeCSS for its copy protection system) and AACS which powered the bulk of the HD-DVDs of the time that BD+ would uphold its protection for atleast the next 10 years. This may have been one of the key factors in the HD-Wars, but alas it seems someone has found a way of traveling into the future and finding the break. I am glad to announce the first successful restoration of the BD+ protected movie “The Day After Tomorrow” in linux. It was done using a blue ray drive with patched firmware (to get the volume id), DumpHD to decrypt the contents according to the AACS specification and the BDVM debugger from this thread to generate the conversion table. The conversion table is the key information to successfully repair all the broken parts in m2ts files to restore the original video content. This small tool was finally used to repair the main movie file “00001.m2ts” according to the conversion table. To verify the correctness i compared my 00001.m2ts with the one AnyDVD-HD creates and they both match. The MD5 hash of this 30GB large file is in both cases “0fa2bc65c25d7087a198a61c693a0a72”. There has to be some kind of firewall around the virtual machine which validates all communication between the ( potentially hostile ) content code and the outside world (traps and events). Part of the rules which are enforced by that firewall are the parameter checks on every trap call. It’s obvious that the traps and the event handling itself has to be carefully implemented. I believe this additional effort is necessary to prevent the content code from breaking out of it’s sandboxed environment and do nasty things like gathering user information and “calling home” when it detects an unlicensed emulator. So because these additional security measures make things more difficult i suggested to test this code first with the easy traps. Even a guy from SlySoft (who makes the ever popular AnyDVD-HD product) chimes in early on but backs off after realising he could well get the sacker. Actually you’d have to know how BD+ really works, to know what I meant (and even then you probably wouldn’t ). I would like to stress again that this project wasn’t intended to circumvent copy protection and promote piracy. This can already be done using commercial software like AnyDVD-HD. Instead this project was an attempt to enable users of open source operating systems (like linux) to playback their BD+ protected discs without having to use proprietary software. Furthermore only two movies “I Robot” and “The Day After Tomorrow” have been proven to be handled correctly so far. Obviously there is still a lot of debugging to be done. Classy! Download a copy of the BDVmDbg build for educational reasons and try PortableBDVM which comes in C99 source form. Came across the funniest interpretation of a Southern Indian song by Prabhu Deva Sundaram, I’m not sure what they’re saying but the sub-titles do speak the truth to the non-speaker. Have you been high toooday?